What is your job at telanova? 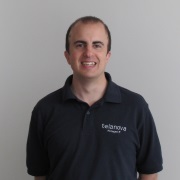 As telanova’s Principal Systems Engineer, the buck stops with me for technical matters, whether that’s implementing a new systems architecture for customers’ more complex requirements (e.g. virtual private networks across multiple sites) or troubleshooting customers’ more complex problems that go beyond day to day support requests (e.g. Disaster Recovery). What’s your commute like? Just 3 miles so whenever possible I cycle on my bike: it’s good for the brain and my health. We have showers at work so it’s very civilised. What do you enjoy most about your job? The trust our customers place in us means that I can get on with the job without the red tape and compartmentalised job functions prevalent in large corporates. When did you join telanova? In 2004, straight after my Computer Science degree. Joining the family business was a good way to start my career in IT, although both Warwick and I were worried whether we’d be able to forge a professional relationship. As it turned out it we worked very well together, I gained a lot of industry knowledge and experience very quickly and over the subsequent 11 years working together Warwick has been able to delegate most of the technical responsibilities of his work to me. What do you do in your spare time? Mountain biking at Swinley Forest, snowboarding, online gaming - League of Legends is my current favourite. And relaxing with friends with drinks and a barbecue. Favourite meal? My partner is a vegetarian so I never pass up on an invitation to a roast; if there’s apple crumble and custard afterwards so much the better. Something no-one knows about you? Had to be hauled off a tennis court to sit my Geography GCSE exam, started half an hour late and handed in my paper half an hour early. And I passed!